Mat transporter..easy to use! Will fit through any standard doorway. 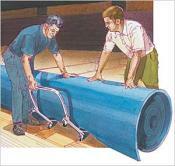 After practice, just tilt this extra strong, reinforced transporter under any rolled-up mat section. A quick push, an upright tilt and the mat is ready to roll away on four heavy-duty, non marking casters. Easy to use..will fit through a standard doorway. Efficient, one dolly will handle mat sections up to 14' wide. Two will handle all large mats.